We have come a long journey, throughout last two decades. Truly it was not so easy travel….. In 1993 – Our Managing Director, Mr. Nilantha Edirisinghe has more than 20 years experience in the business. Before 20 years, this is how he started his career as a “Cushion Work Machine Operator” at another reputed Cushion work Company. 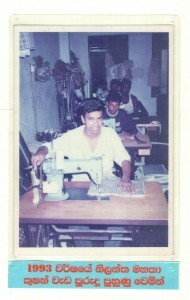 Within the period he grabbed all the required knowledge & experience to open his own new business. He always convey his gratitude to his previous employer for helping him to have a perfect experience…. The experience he got from there was really helpful for him to setup a well-grown business complex…. 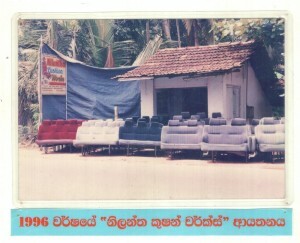 In 1996 – This is how we started our operations in year 1995, as a tiny workshop….. So, it was a long journey of success, towards our current position as the “Market Leader”. We are really happy and proud of our present position and we thank our clientele for always being with us. Certainly, they are the pillars of our success!